other tourist info. If you're based in the FL Keys, get listed for free, and then please link back to us. Please contact us for corrections or advertising info. iPhone users: Save us for quick refererence to Key West and the Florida Keys on your home screen. Choose the "+" button and "Add To Home Screen." Florida Keys From The Air - photo by Roy Rendahl. The Florida Keys are a 120-mile long chain of 800 Islands off the southern tip of Florida, just south of Miami. U.S. 1, also called the Overseas Highway, connects the Keys to the mainland. Directions to many places in the Keys are given by using its mile marker (MM) location. See a mile marker chart at KeysHistory.org. Spring and fall are the busy times, summer and winter are the quieter times; and the fall is hurricane season, but the chance of any size hurricane hitting the Florida Keys is only about once every 5 years. So most of the time it's beautiful there. All of the Florida Keys are part of Monroe County. Southernmost House B&B in Key West - photo by Roy Rendahl. Buy framed prints, note cards, mugs, mousepads, etc with this photo at CafePress. 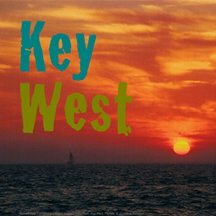 Key West is a beautiful tropical paradise of blue-green ocean, bright blue sky, and red-orange sunsets. It is full of history and culture; with numerous art galleries, live music venues, a variety of great restaurants, and wonderful lodging facilities. 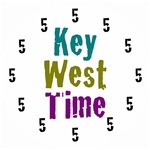 The first Europeans visited Key West in the early 1500s. 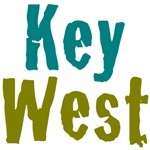 In the mid to late 1800s, Key West was the largest and richest city in Florida, and also the wealthiest town per capita in the U.S.A. 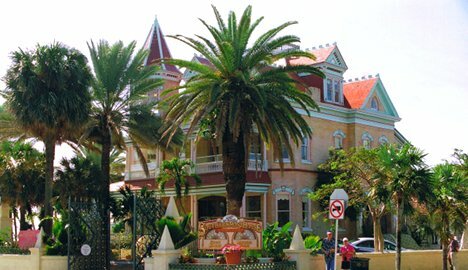 The Key West Historic District includes the major tourist destinations of the island, including Mallory Square, Duval Street, the Truman Annex, and Fort Zachary Taylor. Walking, bicycles, pedicabs, scooters, and little electric cars are the best way to get around the narrow streets in the Historic District. Life slows down a little in Key West, that's called "Island Time." Although a vacation here always goes way too fast, you don't want to leave! 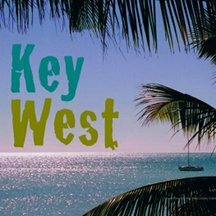 "Key West Cinnamon Sunshine" music video by Roy Rendahl. Featuring photos that Roy Rendahl took in Key West, and island-sounding music by his pop rock band, Poppermost. Key West can also be called Key Weird. It has attracted colorful writers, artists, musicians, and other free spirits for many years. This is especially shown off in the yearly 2 week street party called Fantasy Fest, and in other celebrations and parades throughout the year. Please see my music video on YouTube with photos that I took in Key West. Also see my writing about Key West in the "Insider's Guide to the Keys with Roy Rendahl" on Cheapflights.com. Welcome to the Conch Republic - Key West International Airport - photo by Roy Rendahl. The Conch Republic was formed on April 23, 1982 when the U.S. Border Patrol blockaded the highway from the Keys with a checkpoint looking for drugs and illegal aliens. Key West seceded from the Union, declared War, and then immediately surrendered, demanding Foreign Aid; and creating the slogan "We Seceded Where Others Failed." As a publicity stunt, it worked... the blockade was removed, and it gave a big boost to Keys tourism. The Conch Republic (pronounced "Conk" in the islands and sometimes "Conch" up north) consists of all the Florida Keys up to "Skeeter's Last Chance Saloon," in front of which the blockade was originally set up. 70 miles west of Key West are the Dry Tortugas, 7 islands composed of coral reefs and sand: Loggerhead Key, Garden Key, Bush Key, Long Key, Hospital Key, Middle Key, and East Key. All of the islands are part of the Dry Tortugas National Park. Historic Fort Jefferson is located on Garden Key and is a popular tourist spot accessible by ferry, catamaran, or seaplane from Key West. Big Pine Key and hundreds of islands including Sunshine Key, Summerland Key, Big and Little Torch Keys, Cudjoe Key, Little Duck Key, No Name Key, Looe Key, Sugarloaf Key, and Big Coppitt Key are all considered part of the Lower Keys. This is the miniature Key Deer country and is a quiet alternative to bustling Key West. Marathon Key is called "The heart of the Keys" because of its central Keys location, and includes Long Key, the Conch Keys, Duck Key, Vaca Key, Fat Deer Key, Grassy Key, Boot Key, Crawl Key, and Pigeon Key. Marathon Key has a population of about 10,000. Nature lovers love Marathon for its sailing, fishing, diving, snorkeling, and scuba diving activities. Key Largo is just south of Miami and was made famous by Humphrey Bogart, Lauren Bacall, and Bertie Higgins; and is known as "The Diving Capital of the World" with North America's only coral barrier reef there. The Islamorada Village of Islands has about a 7,000 population and includes Plantation Key, Windley Key, Upper and Lower Matecumbe Keys, and the offshore islands of Indian Key and Lignumvitae Key. Islamorada means purple isle and the area is known as "The Sport Fishing Capital of the World." Please "Like" us and post your Florida Keys photos, info, and events. If you like Keys Scene and want to help support us, please click on the Google or other ads on our pages and/or click below to donate any amount that you wish securely through PayPal. Thank you! Top header photos by Roy Rendahl.